Bealesville Pa. Springfield Oh. Richmond Ind. Wheeling W. Va.
Twelve Madonnas of the trail were placed by the DAR along the "National Old Trails Road" in 1928 and 1929. 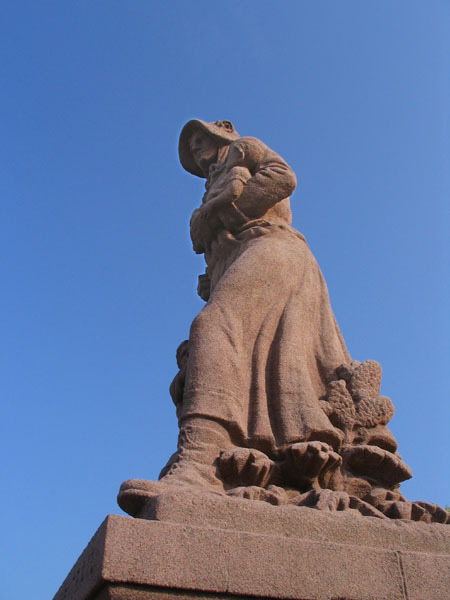 The statues were designed, sculpted, and cast in Algonite by August Leimbach from an idea by Arlene B. Nichols Moss. The DAR describes the statue this way: "'The Madonna of the Trail' is a pioneer woman clasping her baby with her young son clinging to her skirts. The face of the mother, strong in character, beauty and gentleness, is the face of a mother who realizes her responsibilities and trusts in God. It has feeling of solidity—a monument which will stand through the ages." Koegler and Pavelchak see the statue differently: "[I]t appears that the only concession sculptor Leimbach made to his subject's gender was to add breasts to a sinewy, square-jawed masculine figure."